Our legendary "Speed Bar" is gone, however we have a great lounge in our new facility. With multiple televisions, there is sure to be a sport on one of them you enjoy (or will tolerate). We serve the coldest drinks in town, and at the best prices! 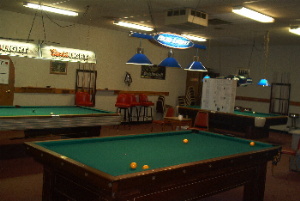 Our legendary Billard Room was destroyed May 22, 2011, along with the remainder of our building. Out of respect for the memories and good times had there, I am leaving the photo posted--there are a lot of memories. Our new "billard room" has a regular size pool table, and the "deluxe" version for the billard version of "golf". There is also a card table with a game every Thursday evening, and many afternoons. We have three (3) RV hookups with water and electricity (30/50 AMP). If you are going to be passing through our area, check us out---we will make you feel welcome.